I’ve said before that reviewing a nonfiction book is not one of my favorite things. That’s especially true when it comes to memoirs or autobiographies. I mean, who knows more about a person’s life than that person? It can sometimes be difficult to review those books. 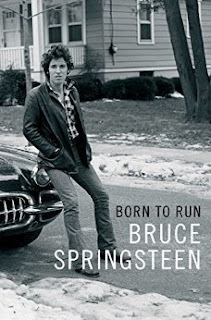 However, I thought I’d give it a try with this week’s review, Born to Run, by Bruce Springsteen. I am a fan of Springsteen’s music. I’ve been to a couple of shows and have a handful of old, 1970s bootleg recordings. While I love reading about musicians, I was just a bit apprehensive about picking up this book. Bruce is known for his preaching and proselytizing. He spends a lot of time between songs telling us how we should be living our lives. He’s earned the right to do so, but at $100 a pop per seat, I just want to hear the music. I was concerned that we would get a book full of the same. I was very pleasantly surprised. Many times when reading rock star bios, you find the subject pandering to his or her fans by continuing to portray themselves in their stage persona. Do you really think Jimmy Buffett only sits in a chair drinking margaritas all day? Or that Alice Cooper wears makeup when he’s at home, scaring passing children? A lot of times these artists have become parodies of themselves. Not Bruce Springsteen. Bruce writes eloquently. He explains himself in a straightforward, unassuming style. His compassion towards his family and his bandmates shines through the words on the page. At the same time, his disdain for anyone trying to take control of his artistic product is well articulated. The whole book is written this way. As he and his family struggled with life in New Jersey, he found his escape in music. Just as so many of his peers, he found inspiration in Elvis and the Beatles. This inspiration, along with the hard work required to make a living for his family, set Bruce on a journey that has made him a superstar today. Born to Run by Bruce Springsteen is one of those memoirs that breaks the mold that so many other artists fall into. Springsteen puts on no airs. He tells it frankly. There is no preaching, which was one of the things I was worried about. Instead, he focuses on this craft, how he’s continued to hone it over the years, and his love affair with music. Probably the most touching part of this book is when he talks about his family. He is a very proud husband and father. He has no problems shifting the focus of his memoir to the people who mean the most to him -- his children. This is the story of his life, every aspect, from birth to today. He tells it all with gusto. This was fun to read. Craig Bacon has his own Wendy. While we weren’t born to run, we were born to love.